NYC's northernmost borough, the Bronx marks the only city borough that's not island bound; instead, it's connected to the mainland of greater New York State. Named for Swedish settler Jonas Bronck, who settled here in 1639, the borough may be best known for its renowned Bronx Zoo (America's largest and oldest zoo), but look closer, and the Bronx is rife with plenty more to see and do. Whether heading out to a ball game to see the "Bronx Bombers" in action, perusing exotic plant species at the New York Botanical Garden, getting up-close-and-personal with the birthplace of hip-hop, or stuffing yourself silly with cannoli and pizza in one of NYC's last great "Little Italy's," the Bronx is filled with lots of great things to do. Home to 27-time World Series champs the Yankees (aka the "Bronx Bombers"), nabbing tickets to a game at Yankee Stadium puts forth a chance to see one of baseball's winningest teams in action. The 2009-debuted stadium (it replaced the original "House that Ruth Built," just across the street), with a price tag of $1.5 billion, this modern arena comes with plenty of luxe touches: lower-level seats offer cushions and cup holders, while the food concessions far surpass "peanuts and Cracker Jack" to include vendors like Brother Jimmy's BBQ, Parm, and Lobel's. The main level Yankees Museum (open through the eighth inning) is a good spot to pop into to peruse team history and memorabilia, while Monument Park (near center field; closes 45 minutes before game time) showcases plaques of famous Yankees players of yore. The baseball season runs from April through October; if there's not a game on while you're in town (or even if there is), you can also sign up for one-hour pregame and off-season stadium tours, too. Founded in 1891, this "living museum" – a National Historic Landmark – is an absolute oasis for anybody with an appreciation for botany and the natural world. The 250 acres provide a home to more than one million lush plants, spanning diverse tropical, temperate, and desert flora. Look out for gardens dedicated to roses, daffodils, azaleas, cherry blossoms, lilacs, water lilies, and more, as well as the Victorian-style greenhouse, Enid A Haupt Conservatory, and 50 acres of old-growth forest. 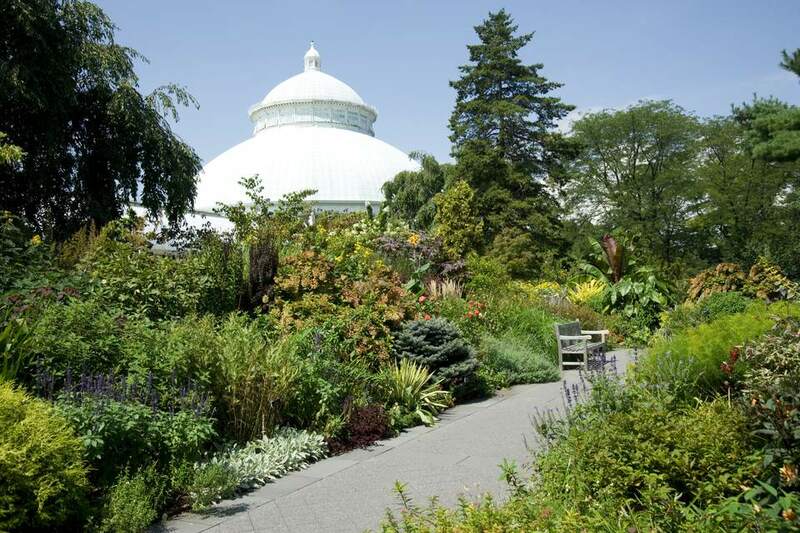 The New York Botanical Garden also put on regular classes, exhibitions, and events, like the annual orchid and holiday train shows; it also runs one of the world's largest plant research and conservation programs. While Manhattan's Little Italy neighborhood is sadly just a touristy shadow of its former self, the commercial Arthur Avenue section of the Belmont neighborhood – aka the Little Italy of the Bronx – is the real deal indeed, a thriving Italian-American enclave wherein food, glorious food, takes top billing. The mouthwatering area teams with quality eateries and chatty shopkeepers hocking all types of Italian staples, from pasta to pastries. Wherever you pop in to sample and stock up, you can be assured of only the freshest ingredients and most authentic recipes. For one-stop shopping, don't miss the covered Arthur Avenue Retail Market, housing numerous restaurants and vendors like Mike's Deli, alongside relative newcomers like The Bronx Beer Hall. The "boogie-down Bronx" is credited as giving birth to the hip-hop genre, and the folks at Hush Hip Hop Tours take the reins at showing their guests a real insider's tour of all of the Bronx's most relevant hip-hop sites, on the streets where greats like Slick Rick, Grandmaster Flash, and KRS-One came up on the scene. The tour company's claim to fame is their hip-hop legend guides, which have included the likes of Grandmaster Caz, Kurtis Blow, Roxanne Shante, Raheim, Johnny Famous, Reggie Reg, and more. Their guides lead the "Birthplace of Hip Hop" three- to four-hour bus tours (the longer tours include a lunch stop), round-trip from Manhattan to the Bronx and Harlem, illustrating hip-hop's four signature elements en route: DJing, MCing, dancing, and graffiti. This 28-acre garden and cultural center touts a stunning location in the Riverdale section of the Bronx, overlooking the Hudson River and New Jersey's Palisades (a line of steep cliffs just across the river). Set on the site of a once-private 19th-century estate – that was formerly home to luminaries like Mark Twain and Theodore Roosevelt, and host to distinguished guests like England's Queen Mother – the Wave Hill estate today provides year-round public parkland, complete with meticulously manicured gardens, water lily and lotus pools, wide lawns, and scenic overlooks framed by benches and a pergola. Its Wave Hill House and Glyndor House play host to much of Wave Hill's cultural programming, including art exhibitions, Sunday concerts, and more. Today, the cottage is operated by the New York City Department of Parks & Recreation, tucked within Fordham's small Poe Park. Visitors can pop in for audio or guided tours of the house, filled with reproduction period pieces and some of Poe's personal effects, too. For something really off-the-beaten-Bronx-path, make way for City Island, a little seaside enclave touting a strong maritime and shipbuilding heritage that's lent the island a flavor that's distinctly more New England than New York City. While the Bronx as a borough is connected to the American mainland, this little island is an exception, accessible via a bridge that reaches out to join it to the greater Bronx from the edge of Pelham Park. Cross the bridge and City Island you will find, a tiny 1.5-mile-long by half-mile wide span that embraces its maritime identity as evidenced by seafood restaurants, seagulls, bobbing boats, and the smell of saltwater galore. With about 4,400 residents, it's a pretty tight-knit community filled with old-timers and old Victorian homes, with the pace of life moving at a refreshingly slower pace than found elsewhere in the big city. Come by to stuff your gut with clams, mussels, lobster, and catch-of-the-day dishes from popular seafood eateries like Johnny's Reef, The Black Whale, and the Lobster Box; then round it all off with ice cream from Lickety Split. For more diversion, rent a boat from local shop Jack’s Bait & Tackle or sign up for a local fishing trip; stroll the boutiques, antique shops, and galleries along City Island Avenue, or pop into the City Island Nautical Museum to peruse displays on the isle's maritime and boat-building history.